Something odd happened a few days ago, high above our heads. In an earlier blogpost, I discussed in detail how the odd spy satellite USA 276 (2017-022A) was set to make a peculiarly close approach to the International Space Station ISS on 3 June 2017. The spy satellite was recently launched for the NRO as NROL-76 by SpaceX, on 1 May 2017. 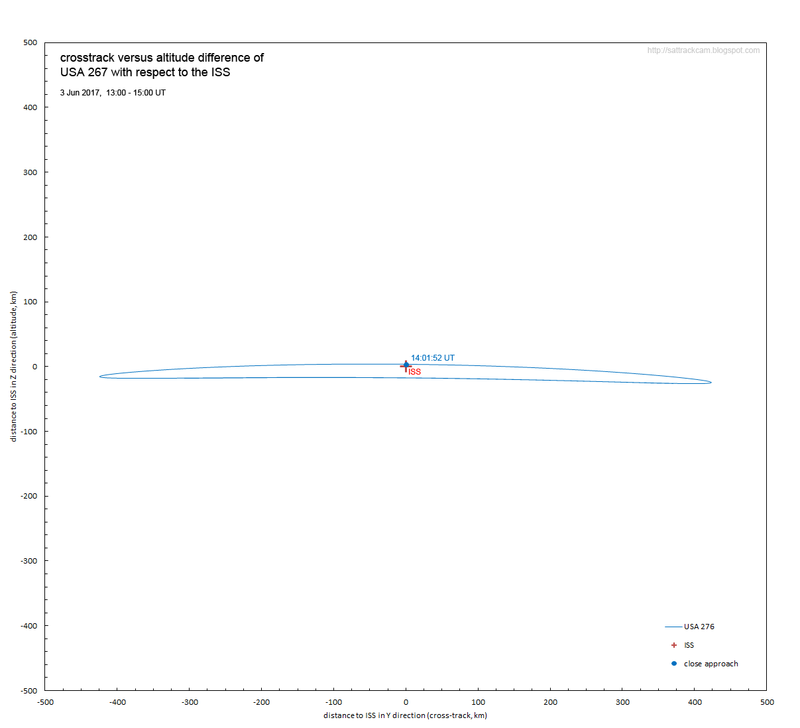 With the close approach moment now in history and post-approach observations of USA 276 available (as well as an orbit for ISS based on tracking data, rather than an orbital prognosis), I present my final analysis of the situation in the current post. 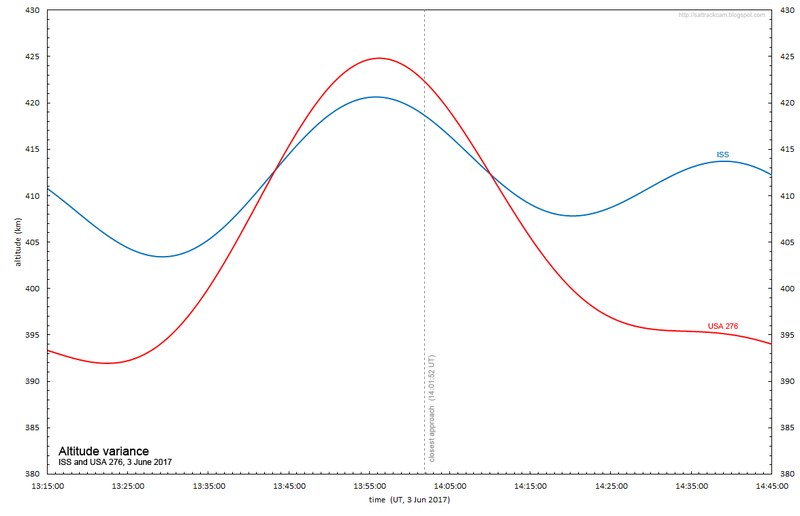 With the new data included, we can establish the moment of closest approach as 3 June 2017, 14:01:52 UT. It happened over the southern Atlantic north of the Falklands, near 43o.75 S, 45o.45 W, with a miss distance of only 6.4 ± 2 km (the ± 2 km stems from the fact that TLE predicted positions have a typical positional accuracy of no more than 1 km at epoch). 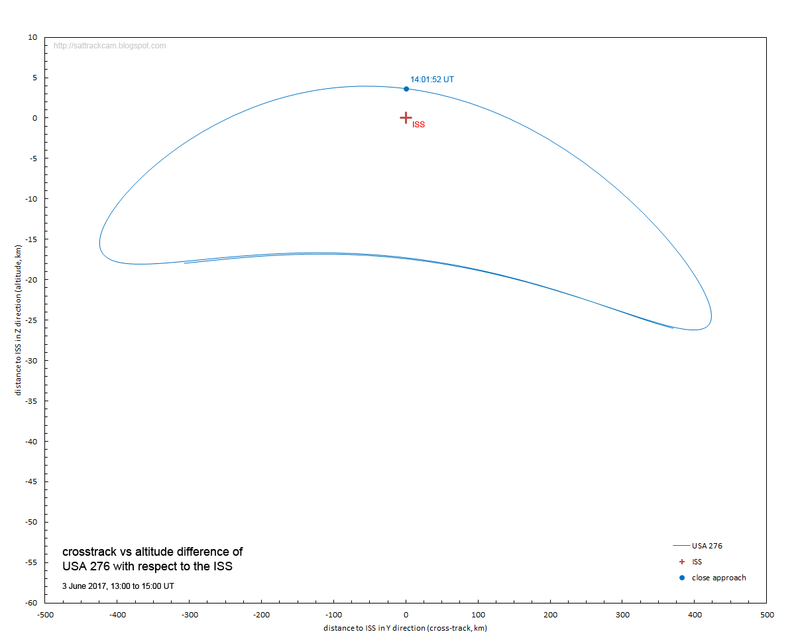 The latter is significantly closer than the approach distances calculated before the approach (which were in the order of 17-20 km, see my earlier post). Ted Molczan also analyzed the situation and he finds an even closer nominal distance of 4.5 km (but within uncertainty intervals our results overlap). For detailed purposes like this, the orbit determination is a bit sensitive to what observer data are included. 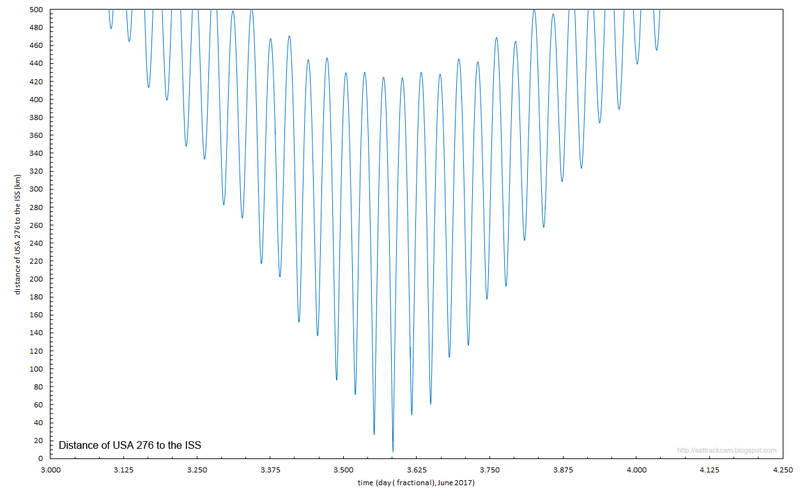 I restricted myself to observers with known high accuracy in the orbital solution above. 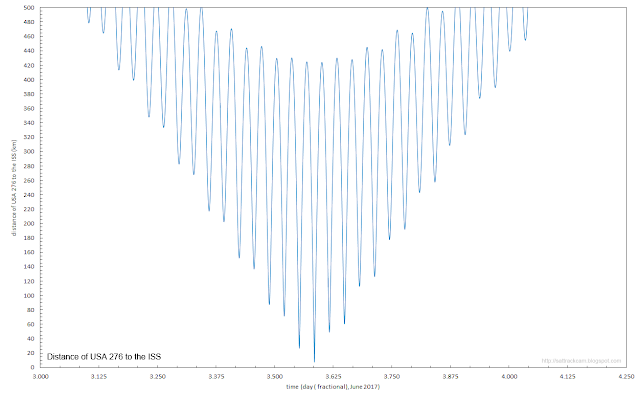 Note: as positions from TLE's have an intrinsic uncertainty (about 1 km at epoch time), the values in the table above have an uncertainty of about 2 kilometer. 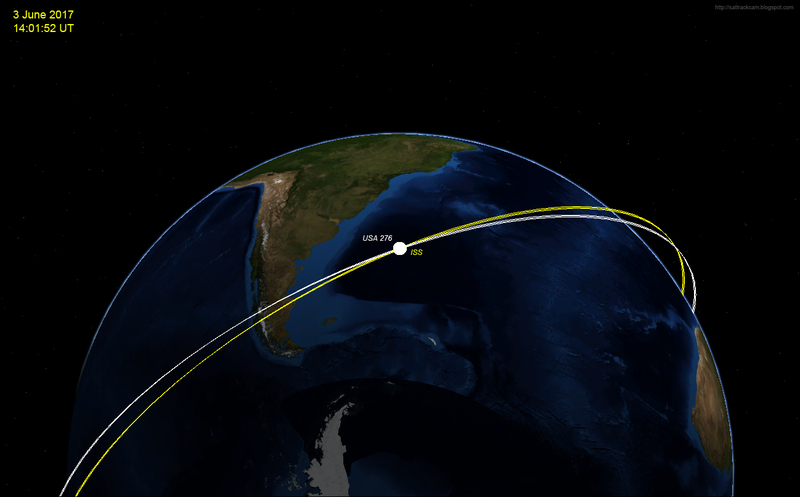 As can be seen, USA 276 was a few km (nominally 3.65 km) above the ISS at closest approach. 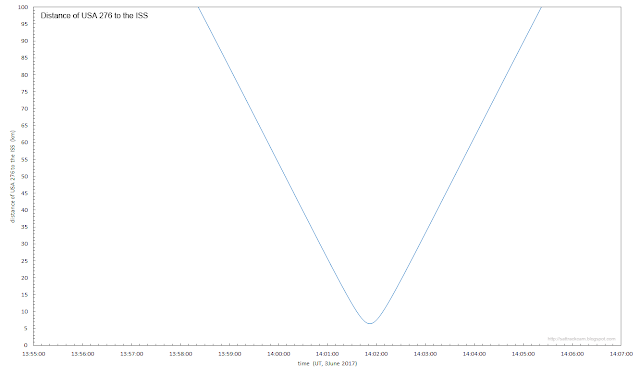 It was nominally also a little bit over 5 km behind the ISS. 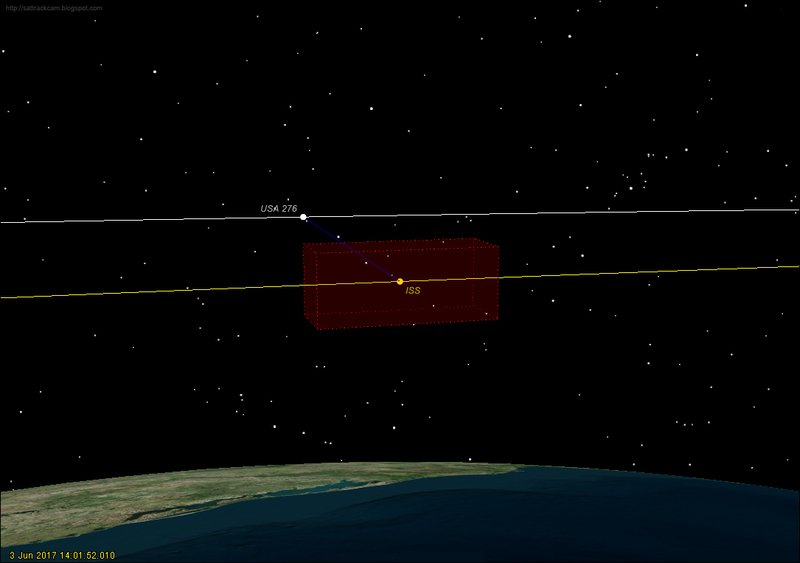 A collision avoidance manoeuvre is usually evaluated if an object comes within a box of 4 x 4 x 10 km of the ISS. If upon further evaluation the chance of collision is larger than 1:10000, an avoidance manoeuvre is done, if circumstances allow this. USA 276 remained just outside the 4 x 4 x 10 km box at closest approach, as can be seen in the illustration below (red box, the situation shown is for the moment of closest approach). The box represents a collision risk in the order of 1 in 100 000. I remain agnostic on the question whether this close approach was intentional or not (see discussion in my previous post regarding some possible goals would the approach have been intentional). Ted Molczan published a discussion of pro and contra arguments on the question whether the approach was on purpose or not on the Seesat-L list on June 3. 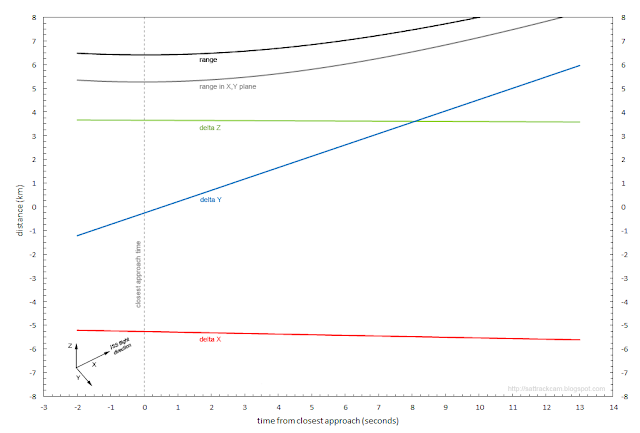 While Ted argues that the April 16 and April 30 postponements of the launch indicate a non-planar preference of the orbit (which argues against intention), this also means that this close approach could have been avoided by picking another launch moment. 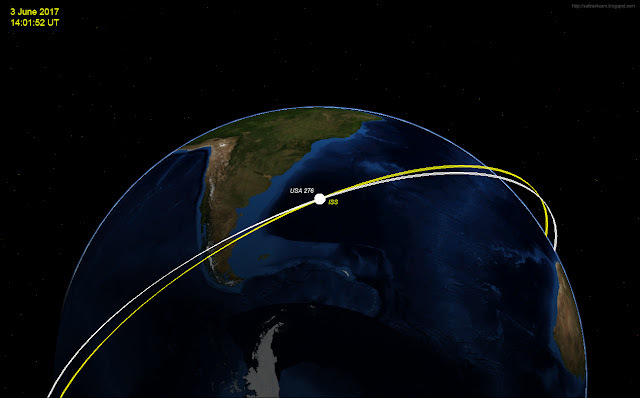 While USA 276 remained just outside the safety concern box, it is weird to have your just launched classified payload pass so close (6.4 ± 2 km) to a high profile, crewed object like the ISS. I can and do not believe for a moment that the NRO was not aware that the launch on May 1 would lead to the close ISS approach a month later. It would be extremely sloppy of them, from a Space Situational Awareness viewpoint, if they were not aware, especially given how close the orbital parameters are to that of the ISS. So I am struggling to understand why the NRO allowed this close approach to happen, if it was not intentional. This event was bound to attract attention and that harms the classified character of the mission. USA 276 is relatively brigh and the approach was bound to be noted by independent observers. Indeed, some space enthusiasts in Europe unaware of the issue who were out to spot DRAGON CRS-11 and Cygnus OA-7 close to the ISS on June 4, did accidentally spot USA 276 passing some 3 minutes in front of it. It is also an extremely sloppy thing to do because this close an approach to a high profile object like ISS is politically risky. As the ISS is an international cooperation which includes two parties (the United States and the Russian Federation) that are currently geopolitically on an uneasy footing, sending your military payload so close to the ISS as one party is eyebrow raising. This, and the timing (the close coincidence with the Dragon CRS-11 arrival at the ISS [edit: this refers to the originally planned date of arrival at June 4, later postponed by one day]) was bound to generate questions and suspicions (as it did). 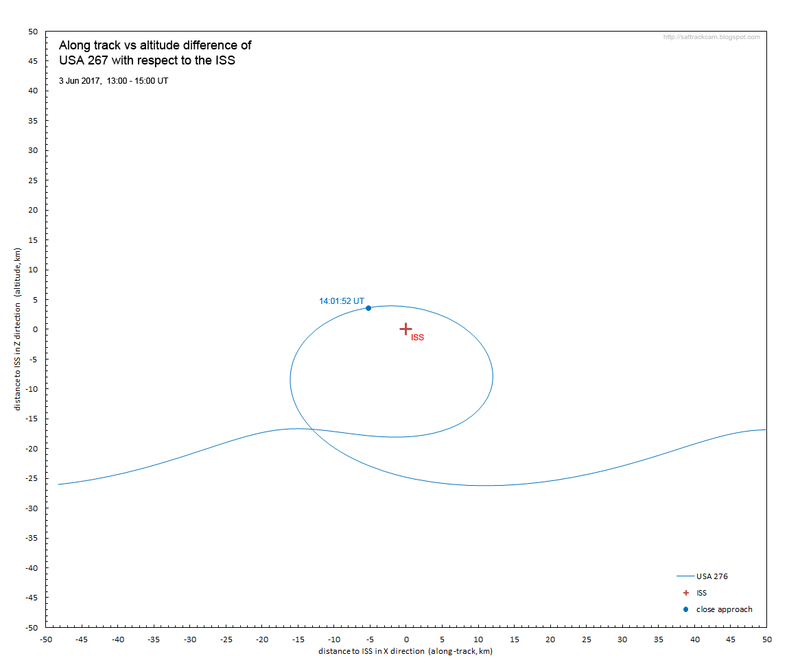 What the NRO did with USA 276 in the last few days was therefore really weird. But then, the current administration of the USA is doing very weird things, and perhaps someone in the new administration signed off on this without fully understanding the depths of it. The Trump administration after all is not quite the posterchild for competence. June 3, the launch date of SpaceX's Dragon CRS-11 cargo spacecraft to the International Space Station (ISS), was clouded out in Leiden, much to my frustration. But yesterday evening was (sort of) clear, albeit with cirrus in the sky and a moon that was quite a nuisance. It allowed me to observe the ISS, the Dragon CRS-11, and Orbital ATK's Cygnus OA-7, which had de-coupled from the ISS a few hours earlier, making a low elevation pass (less than 35 degrees elevation) in the southern sky. 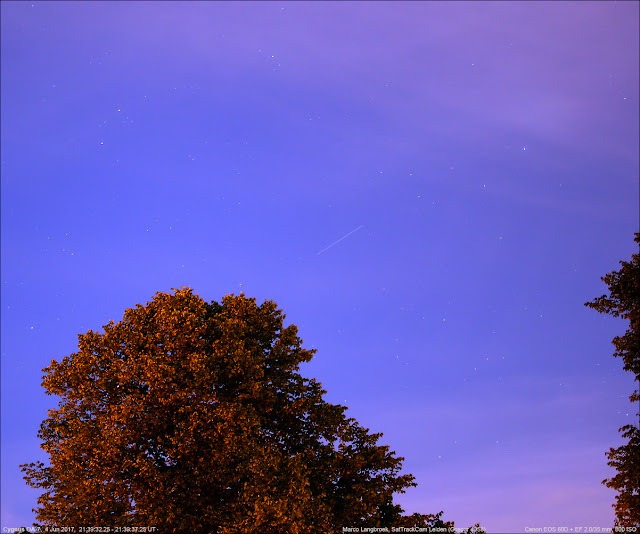 The image above shows the ISS (the bright object near the tree) and, as a faint trail, the Cygnus OA-7 (upper right corner, in the cirrus), descending towards the SE horizon. I did not expect the Dragon to be behind the ISS: I expected it somewhat in front of it. So initially I was miffed that I missed it (see below, this evening did not go quite well): to be surprised by it appearing behind the ISS! This evening did initially not go well, but in a weird way eventually turned out fine. A number of objects would pass in a short timespan of a few minutes: USA 276, the Dragon solar panel covers, Dragon, ISS, and somewhere nearby the ISS also Cygnus OA-7. There were no post-ISS-release elements for the Cygnus yet, so its position would be a guess, although I reckoned it probably still was close to the ISS. Cygnus are usually faint (this time too) and only naked eye objects under favourable circumstances (usually, as this time, close to shadow ingress). For Dragon, only a day old elements were available. These placed Dragon a few minutes in front of the ISS. As it no doubt would have manoeuvered during that day, I expected it to be closer to the ISS in reality, but that it was behind the ISS, that was a bit unanticipated. The passes occurred in twilight (sun about 10 deg below the horizon). As obtaining new astrometric data on USA 276 (see story here for as to why) was important, I had set up the WATEC video camera to capture it, from the loft window (the only spot in my house where I can view that low south). That took me longer than expected, as I initially had some trouble finding the target area in the video view (it was still deep twilight). 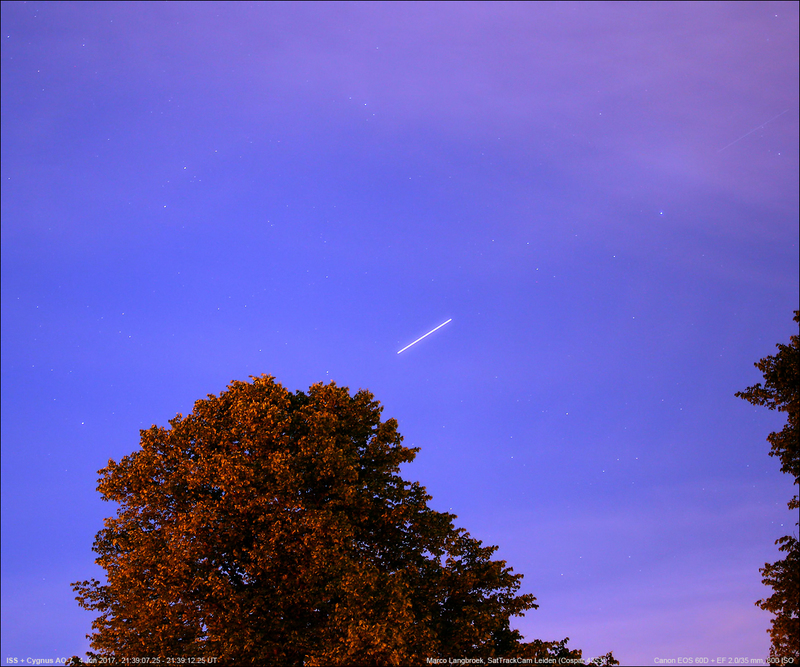 As ISS had passed the moon (which was a bloody nuisance, smack in the middle of the trajectory line) and was descending into the trees low in the south-southeast, I spotted a second, not too bright object chasing it (see first two images above). As I was photographing it and it descended into the trees, I re-aimed my camera hoping to catch it in a gap on the other (left) side of the tree. Then I saw yet another object descend into the right side of the tree, and realised this was either Dragon or Cygnus. I initially thought, to my dismay, that it would be just outside my camera FOV. Luckily, back home later it turned out it still was in the FOV (I used a 35 mm lens). 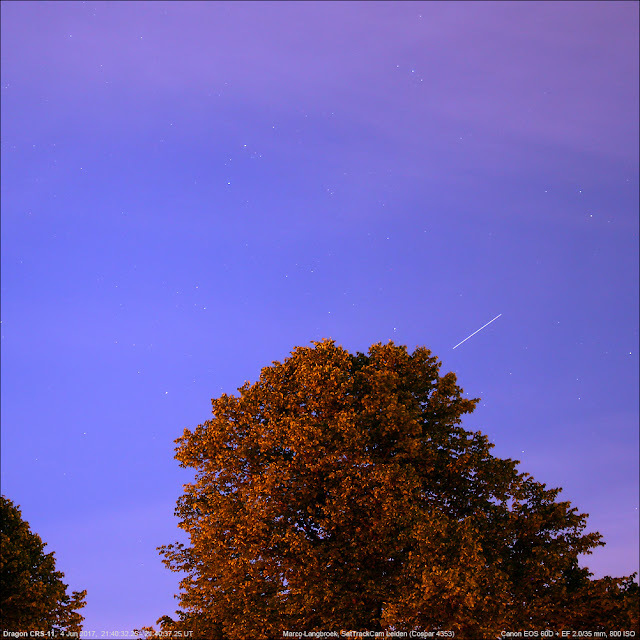 The first, faint object on the same trajectory as the ISS some 25 seconds behind it I for this moment identify as Cygnus OA-7. The second, brighter one, on a trajectory just south of that of the ISS some 1m 25s behind it, I for the moment identify as the Dragon CRS-11. In a previous post, which is currently gaining media traction (e.g. here for a serious article on CNet, and here for a raunchy UK tabloid version, which is also NSFW by the way), I wrote in detail about the curious situation with the recently launched US spy satellite USA 276 (launched as NROL-76 on May 1). It appears to be moving towards a series of surreptitious very close approaches with the International Space Station (ISS). For more details see my post here. While browsing the website of Ball Aerospace, the company that built USA 276, I found that they also have built RAVEN, an instrument delivered to and installed on the outside of the ISS in February this year. "RAVEN is a technology demonstration mission that aims to advance the state-of-the art in rendezvous, proximity operations and docking. Raven includes visible cameras, an infrared camera and a flash LIDAR, called the Vision Navigation Sensor (VNS). 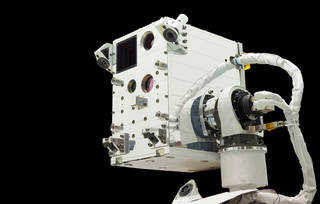 In building and designing the VNS, Ball has provided Raven with its “eyes,” which will watch vehicles approach and depart the ISS." So, let that sink in: Ball Aerospace, the company that built USA 276, a spacecraft that appears to be secretly moving towards a series of clandestine very close approaches to the ISS, also built RAVEN, an experiment installed on the ISS to monitor close approaching spacecraft. 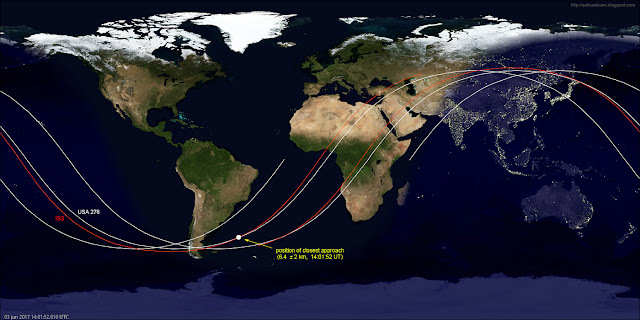 NROL-76 is said to have been part of a "delivery to orbit" contract: e.g. the spacecraft and its launch is the responsibility of the builder (Ball Aerospace, who hired SpaceX for the launch), who hands over the spacecraft to the customer (the NRO) once in operational orbit. The question now is, is USA 276 at this stage still operated by Ball Aerospace, or has it been handed over to the NRO already? (even if it isn't, I cannot believe that the NRO would have been kept in the dark about these ISS approaches. It would, however, create 'plausible deniability'). RAVEN was built by Ball Aerospace for NASA’s Goddard Space Flight Center. It is a possibility that it was jointly funded by NASA and the NRO (but that is pure speculation). Still, to use the ISS in this way is quite brazen, to say the least. Note that while NASA participates in the ISS, the ISS is not owned by NASA: it is an international partnership that besides NASA includes ESA (Europe), JAXA (Japan), Roscosmos (Russia) and Canada, who would probably reject the idea of the ISS being made part of a classified US military experiment (certainly the Russians would). A good summary of the pro's and con's on whether the ISS-USA 276 conjunction is coincidence or not, and whether there is a connection to RAVEN , by Ted Molczan is on the SeeSat-L list.